Ride the Flavour and Cookening, a recipe which works! Cookening is a quite recent platform which was created to satisfy both travelers in search of authentic culinary experiences and local people wishing to share and bring their culture alive. Cookening makes the link between these travelers and local people by giving them the opportunity to meet around a meal. Meeting, sharing, and intercultural exchanges are the magic words of these experiences… Such common points created an obvious link between Ride the Flavour and Cookening… And here we are : we are partners! 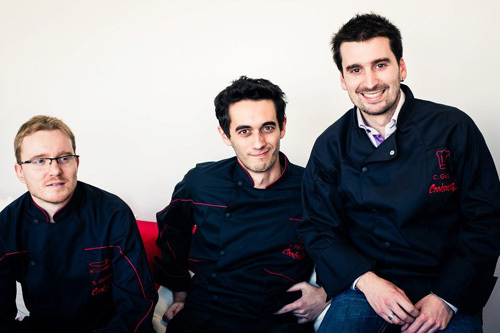 Welcome to the Cookening team (from left to right: Sébastien, Julien and Cédric) and community! The meal gets back to privileged moment of meeting and sharing. Congratulations to the Cookening team and welcome in the Ride the Flavour adventure!